Blackpool goalkeeper Christoffer Mafoumbi has been recalled from international duty to give the club a timely boost. The 25-year-old had been called up to the Congo squad for their African Cup of Nations qualifier against Zimbabwe. But following Saturday’s injury to Blackpool’s first-choice keeper Mark Howard,his deputy Mafoumbi has reported back to Bloomfield Road and took part in training with his team-mates yesterday to prepare for this weekend’s trip to Bradford City. It had been feared Myles Boney would be the only goalkeeper available, with Howard set to undergo Achilles surgery which will keep him out of action for the remainder of the season. Manager Terry McPhillips said: “It’s great news and Christoffer will go straight in now. Number one Howard ruptured his Achilles early in the 3-0 defeat at Burton Albion. He was replaced by Boney, whose mistake gifted Burton their second goal as the Brewers eased to a comfortable victory. “We’re really disappointed for Mark,” McPhillips added. “I think he sees the specialist today (Tuesday) and then he’s getting operated on. Blackpool have confirmed that supporters will have an opportunity to quiz the club’s new board at a fans’ forum next week. Ben Hatton, Michael Bolingbroke and Tim Fielding are all due to attend the meeting, which will be held at Rowley’s restaurant inside Bloomfield Road on Wednesday, March 27, starting at 7pm. The availability of fellow board member Ian Currie is yet to be confirmed. Attendance is by invitation-only and around 50 supporters, including representatives of the different fan groups, are expected to be present. Additional places will be allocated to the wider fan-base via a random draw. Supporters are also being urged to vote on the design of next season’s away kit. Fans are asked to choose between two retro Errea designs – a traditional white and tangerine strip or the blue stripes first worn in the 1930s. The last time the Seasiders used the striped blue kit was during the 2010/11 Premier League campaign. 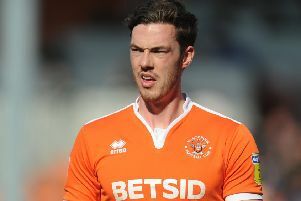 This season Pool’s change kit is white with tangerine, but a new design is due for the 2019/20 campaign. It’s understood a new kit sponsor is being sought. You can cast your vote on the club’s website.